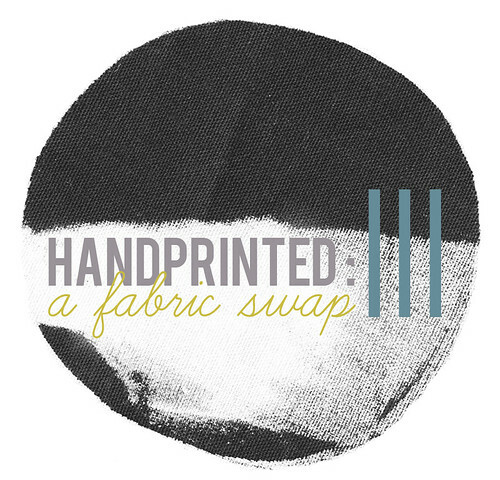 Want to experiment with some fun new techniques and snag a meter of handprinted fabric for yourself? Read on! You'll be sending one printed fat quarter to each of four assigned swap buddies and receiving four printed fat quarters from these same folk. Whether you want to print one whole meter (yard) and chop it into quarters or you want to print four separate 50cm x 50cm (18inch x 20inch) pieces is up to you. Designs must be your own and hand printed using whatever technique you want to play with. Please print on natural fibers - cotton, linen, hemp or a blend of these - and be sure you use ink/paint designed for fabric (you can read a post about fabric and paint/ink options here). You will be sent your swap mates' preferred colours but, in the end, ink colours and design are entirely of your own choosing. Signups will be open until Thursday, February 28th. Your swap group details will be sent to you by Sunday, March 3rd and the deadline to send your fabric is Monday, March 25th, giving you three whole weeks to play around with techniques. This swap is open to anyone, anywhere in the world, which means if you sign up, you have to be willing to ship fabric overseas (since we'll only be sending fat quarters, you should be able to sandwich your fabric between two pieces of card and send it in a C4 (8.5 x 11inch) envelope to keep postage costs down). and please feel free to use the large image above to blog about the swap, the more the merrier! Amazing - all signed up - I can't wait! Off to daydream about what I will print - and HOW I will print it! Yay - can't wait to join this time! Oh yes please, count me in! Hi, I am going to sign up as well. I have no blog and I hope that's no problem. I am going to stamp and paint on cotton or linen. This is very exciting - I've never taken part in such an adventure! Forgot to mention: I'm living an the other side of our beautiful planet! Welcome to the swap, everyone!! It's been so exciting to see the groups come together so far : ) Eva, no blog or website is no problem at all and anyone in the world can participate to it's all good, happy to have you! Fun idea! Glad you sponsored it so I could find you! Aloha from the Big Island!! This sounds like amazing fun! count me in! I just signed up and I know exactly what I'm going to do. Can't wait! I`m in, glad to participate. This sounds like serious fun! I have sent you an email, hope you received it? Yes, my first swap and something I have been so interested in. Yippie! oh no, i just read about this in one of the blogs. i'm sad i missed the sign up deadline. do you do this every year? i would love to try it out next time.